Rain World is a deeply cold and strange place. It is a world filled with strange creatures and cold colours. A place of horrible apathy, and surprising empathy. Rain World is not the game you think it is when you start it up. Instead, it is a surprisingly deep tale of a little lost Slugcat and the strange entity that finds it. 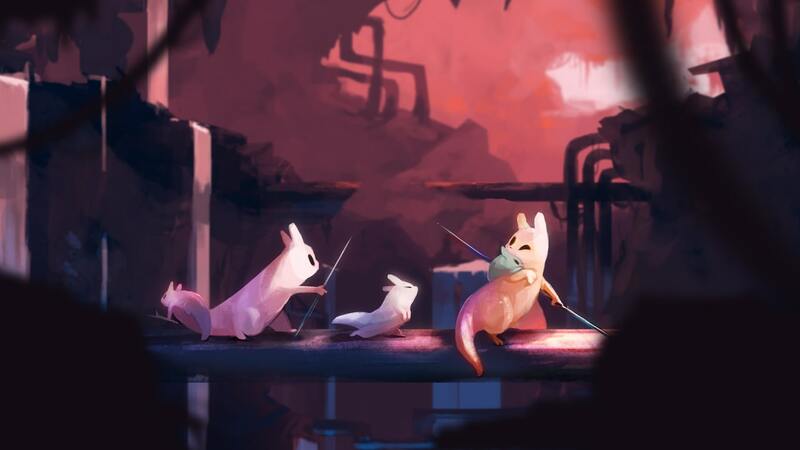 This is a platform survival game, one that starts with your poor little Slugcat falling from the back of its parent and trying to get back home. As you climb, vault, and scuttle your way around you will come across a weird little robot that will guide you to safety. To begin with, the only thing you need to try and do is move forward. You have to make sure you have enough food to survive though, so in between safe places, you’ll need to hunt down some insects in order to survive. These little excursions are fine at first but quickly become utterly terrifying. You aren’t the only predator in this world, you have to beware the many predators that stalk you. From sentient carnivorous vines to brightly coloured lizards, there are plenty of threats to your safety. It is hard to begrudge these creatures though, after all, they are just trying to survive in this dark damp world. The platforming is hard, make no mistake, this isn’t a game designed to be strolled through. You will have to figure out where to climb, what pipes to crawl through, and when to take a leap of faith. You will get frustrated, you’ll fall down, you’ll get dragged into tiny spaces by nightmare fuel and eaten. Push through all of this though, because the journey is worth the struggle, in fact, the struggle makes the journey all the better. Honestly, Rain World says a lot of things and I am not sure I even heard all of them. It is a game that is far deeper than I was expecting. It talks of the struggles of life, the joy of overcoming an obstacle. It says a lot about why you should try and help people, not just beat them down, even if you don’t know them. The messages it sends are hidden a fair way in, but they are important, and this is an important game. It is odd to only just be getting to this game now with it having been out a while. The joy of the Switch is that once again Rain World will be brought into people’s lives. The resurgence is going to be good for the few who play it, but I think it will probably still be criminally overlooked. Even those that start it might not see it all the way through, but I implore you to do so. This is a cold and loving game that is far more than most people realise. It is worthy of both your attention and your time. It thoroughly deserves this second chance and I hope that people make the most of it. Also, I want a Slugcat now.